SportsBetting Casino Review - Is SportsBetting.ag Legal For US Players? On the surface, one would not think that a betting site called “SportsBetting” would include online casino games, but don't judge this book by its cover. In fact, SportsBetting is home to one of the fastest-growing Internet casinos. They offer a complete operation covering a wide variety of games, fantastic customer service, and a reputation for quick and easy payouts. Add all of this up and the new hot-spot in town for casino games online is SportsBetting. Below, LegalCasinosUSA.com gives readers the chance to learn more about the SportsBetting casino. It's important to understand what is available, with the goal to simulate and even improve on a land-based experience as much as possible. With this goal in mind, this page will provide information on different processes that account holders will go through at SportsBetting, along with the opportunities and rewards they may pursue. There are three steps involved in the creation of a SportsBetting account. They cover 'personal information', 'account details', and 'contact information'. The only personal information required is the name of the account holder, a valid email address, and their date of birth. The account details cover the password, and a security question + answer. The contact information covers the account holder's state of residence, address, and a phone number. Once this is completed, the account will be created. For any questions on creating an account, SportsBetting provides the contact information for customer service on the page. A live chat representative can be available instantly. SportsBetting also ensures that the information input on this page is protected to every possible extent. Available deposit options don't get any better than with the SportsBetting casino. The options cover several methods, including credit cards, wire transfers, and money orders. SportsBetting accepts as many credit cards as any online casino. Visa, Mastercard, and American Express are all accepted by SportsBetting to fund your account in the most convenient way possible. Users may also fund their account via third party rapid transfer services such as Western Union and MoneyGram. Either of these methods are lightning fast, completed within 30 minutes. Both a credit card and a rapid transfer require at least a $50 deposit. SportsBetting can also set up a wire directly to your bank in order to fund your account. There are several steps involved in initializing this transaction, but once they are done, you will be able to move money about freely directly between your accounts. Check with SportsBetting for more details on bank wire deposits. The casino at SportsBetting has a couple of exciting first-deposit bonuses. The first is a live-dealer casino $25 free play. When a players logs onto SportsBetting and uses the live-dealer casino play for the first time, if they win money, great! However, even if their first turn or hand loses, they will be eligible for up to $25 of the money they lost back in free play. This is essentially a risk-free $25 bet where a loss would be refunded by the casino. If a player prefers to play the slots, a 100% match on any deposit over $100 to a maximum of $5,000 is offered. There is no bonus code required. There is a 50X rollover for any bonus accepted with these conditions, meaning the deposits and bonus received must be played 50 times for a withdrawal to take place. There is no maximum on the number of times this bonus can be earned by players. They can choose to receive it on every deposit, sporadically, or never. This bonus is entirely optional. 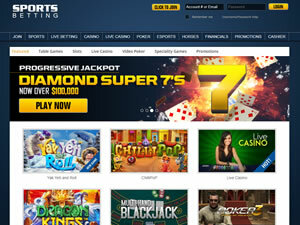 The SportsBetting casino has a full allotment of online games, and is one of the most trusted legal casinos online. They cover slots, table games, 3D slots, video poker, and specialty games. On the main page of the casino at SportsBetting, users can check out all of the games by clicking the topic tabs at the top of the screen. Users do not need an account to preview the games. Players can check out the category of games within the generic topic. This provides great insight, and users targeting specific games can check to see if SportsBetting meets their requirements. The live dealer option has become popular as well. SportsBetting states on site that the only thing the live dealer can’t do is get the player a free drink. Outside of that, it's as if the user is at a land-based casino enjoying their favorite game. SportsBetting Casino Software - What's Under The Hood? SportsBetting Casino has Real Time Gaming software as the brains behind the operation. RTG is highly reputable in the industry. The virtual experience is first-rate, allowing users to enjoy every aspect of their experience with the focus on winning rather than the mechanics of the website. Safe and easy payouts can be had at the SportsBetting casino. Players have plenty of choices. Checks, wire transfers, and bank wires are found. In fact, three different check types can be selected. Players have a mail option, courier, and an ExpressCheck, which is an overnight service. All come with the same limits, the difference is in the time it takes to receive your check and the fees attached. ExpressChecks are the fastest of the three, but can incur a higher fee. However, these can be avoided at SportsBetting as they will offer to cut a check of your winnings with no fees attached as often as once a month. For faster options, you can go with a third party rapid transfer service. There are cases in which a payout can received in the same day as they take only 12-48 hours to get to the player. Western Union or MoneyGram is accepted. SportsBetting can also set up a wire directly into your bank account for lightning quick access to funds. The customer service staff at SportsBetting Casino is there to help 24/7. There are three different contact methods. Join in a chat on-site with a representative for instant help. Additionally, an email can be sent to casino@sportsbetting.ag. Users can submit an inquiry and expect a response within 24 hours. The phone number to call is 1-888-843-9027. SportsBetting makes sure that they are available to anyone interested, or anyone with questions.